Two UC Berkeley faculty — an improvising pianist and composer and a scholar of 17th and 18th century English literature — have been named Guggenheim fellows for 2013, an award conferred for both achievement and promise. 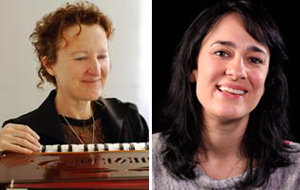 Berkeley’s new Guggenheim Fellows, from left: composer and pianist Myra Melford, English literature scholar Joanna Picciotto. Myra Melford, an associate professor of music, describes herself as a sonic explorer with a restless curiosity and openness to collaborative creativity. A performer as well as an educator, Melford joined Berkeley’s music faculty in 2004. Since then, she has developed and taught a series of courses in contemporary jazz and improvisation-based music for performers and composers. She also lectures on innovations in jazz and other topics in contemporary improvised music. The two are among 175 American and Canadian scholars, artists and scientists selected from among almost 3,000 applicants for fellowships awarded by the John Simon Guggenheim Memorial Foundation in the competition’s 89th year. The fellowships are meant to “assist research and artistic creation,” according to the foundation. The full list of new fellows can be found on the Guggenheim Foundation website.